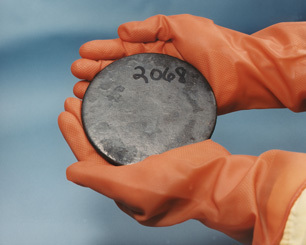 Uranium is a naturally-occurring element found at low levels in virtually all rocks, soil, and water. When refined, it's used for ships, submarines and nuclear weapons. It's also used to fuel nuclear power plants. Uranium arrives in drinking water most commonly through natural sources. According to the EPA, 99% of uranium ingested on a daily basis is removed rapidly, with the rest being filtered out by the kidneys within a few days. Uranium can be treated with reverse osmosis (99% removal), anion exchange, activated alumina adsorption, electrodialysis, and enhanced coagulation/filtration.